If you have regular dental exams, your provider likely has x-rayed your teeth; this can help pinpoint a number of dental issues and concerns, but also is how your dentist evaluates your wisdom teeth. Not sure if you have wisdom teeth? Most adults do, though some may never even realize it. The real issue comes when there is a reason to remove the wisdom teeth, which may sound dreadful and daunting. Don’t worry; your dentist can explain the benefits of removing your wisdom teeth as well as the precise procedure involved. What are wisdom teeth, and when should they be removed? If you are wondering whether you have wisdom teeth, know that most people get theirs in late teens or early adulthood. Sometimes, your wisdom teeth contribute to proper alignment but more often, your wisdom teeth can become misaligned and require removal by your dentist. It is important to maintain regular exams with your dental provider for occasional x-rays to determine how your wisdom teeth are positioned and aligned. Depending on the outcome of this exam, your dentist may refer you to an oral surgeon for a consultation. 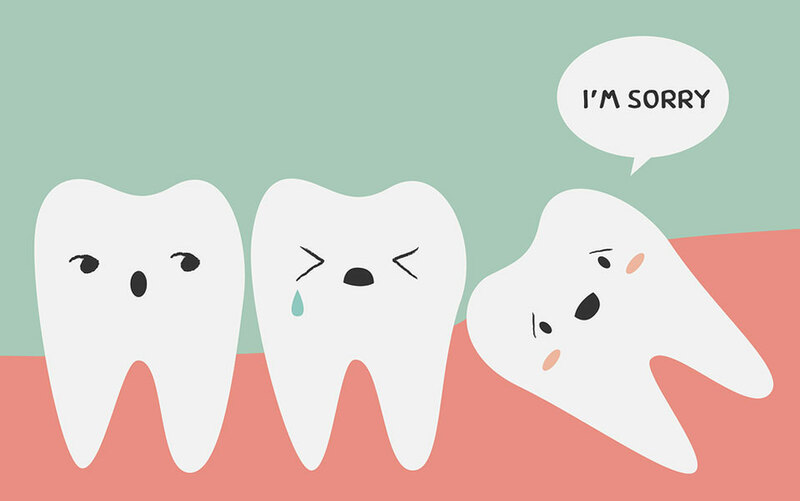 When your wisdom teeth are misaligned, they will need to be removed. Their positioning may crowd your other teeth, even causing dental damage in some instances to surrounding teeth, the nerves, or your jaw. When your wisdom teeth erupt or break through the gum, it is very easy to remove them and doesn’t require surgery. However, if your wisdom teeth are impacted, meaning they are under the gums, they will require surgical extraction and the sooner the better. Partially impacted wisdom teeth are havens for bacteria and potential infection, which can be a very painful situation. When you are young, the roots of your teeth are less-developed and your bones are less dense which makes extraction easier. It may take older patients longer to heal and recover. The less-invasive procedure is when you don’t need to incise the gums and remove bone for impacted teeth but are able to simply remove the wisdom teeth as you would any other tooth using a local anesthetic to numb your mouth. Worried about your wisdom teeth? Talk to your dental provider in Mt Pleasant, SC, to learn more and have your mouth x-rayed. This will pinpoint the positioning and alignment of your wisdom teeth, which will determine the best way to move forward.